Our last days in the US of A spent around the Olympic National Park in Hoodsport and Port Angeles, Washington. We were just about at the top of Canada’s pants (also known as America) and what better place to spend our final days in Washington than in the forest overlooking Mount Washington itself? After talking to a German couple in Tillamook, we learned about the Coho Ferry that runs from Port Angeles, WA to Victoria, BC and decided to avoid the Seattle traffic and sail right into Vancouver Island. 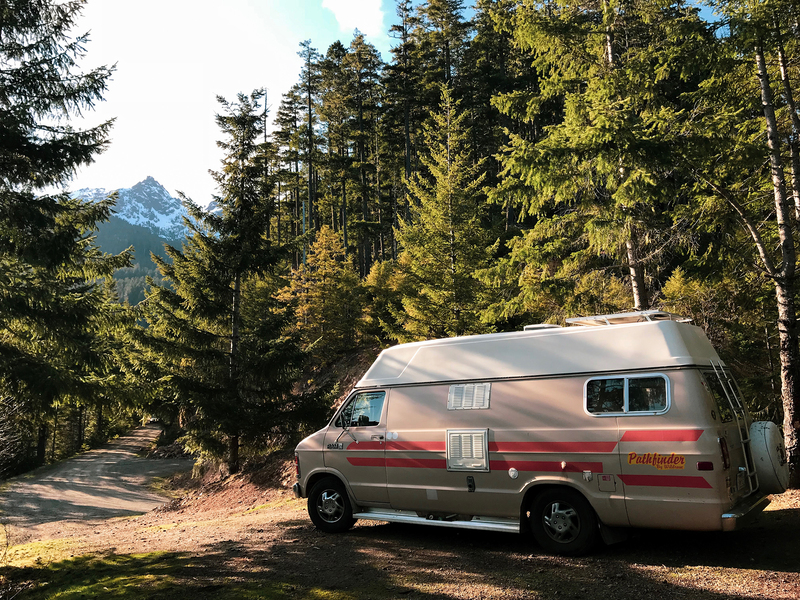 Sticking to western Washington State, we found an amazing spot in the Olympic National Forest with a view of Lake Cushman and the snow capped mountains. We could have stayed here forever, soaking in all the amazing views and reliable AT&T service. 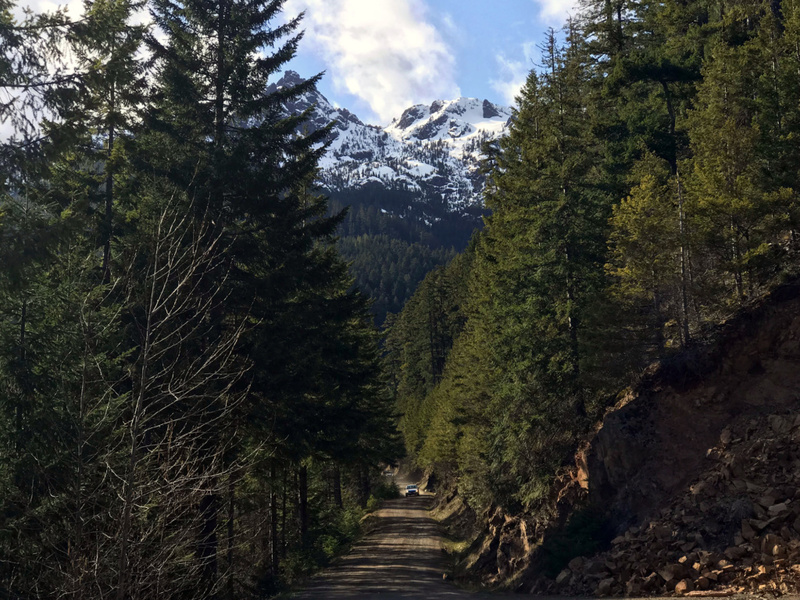 Once we finally parted ways with that wicked spot in the National Forest, we visited the National Park only to find out that it was still largely buried in snow. 118” of snow, to be exact. I was really looking forward to hiking to the natural Olympic Hot Springs, but unfortunately, the road leading to the trailhead was so severely damaged by a storm a couple years ago that it’s closed indefinitely so they would be quite a trek to reach by foot. It’s always worth checking the road conditions before you go to avoid disappointment. 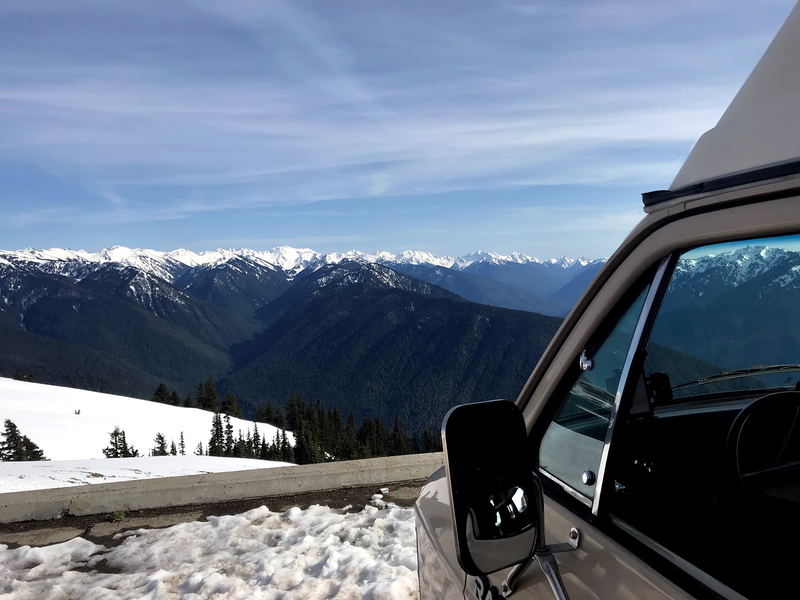 Speaking of road conditions, we seemed to arrive just at the right time when the road up to Hurricane Ridge was fully plowed and open to drive on. It’ll only get you as far as the Visitor Centre but the drive is pretty spectacular. At 5242’ (1598m) elevation, this is where they measured the 118” of snow. Luckily, from the Visitor Centre, you have a clear view of Mount Olympus and its surrounding mountains that make for a pretty epic snowy scene. It’s hard to believe that within 20 minutes, your drive goes from rainforest to forests blanketed in snow. It’s a super cool place to check out that looks good in any season. The National Park also has webcams set up at the Visitor Centre so you can get a sneak peak of what the conditions are like before making the drive. We spent our last days in the cute little town of Port Angeles where we stocked up on all of our American goods before heading toward the border. Just a short drive from the city, we spent some time at the Ediz Hook Bird Refuge and relaxed on the rocky beach with a view of Vancouver Island from one angle and Mount Baker from the other. 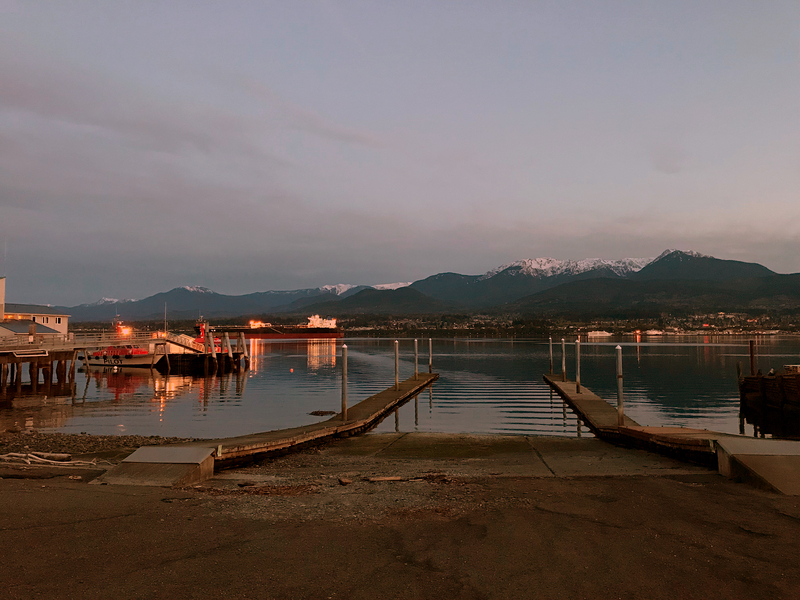 The harbor of Port Angeles also looked pretty magical in the twinkle of lights from docked and visiting boats – a pretty great little seaside town that made for an awesome farewell to our time in the states. The time has finally come to venture back to Canada and start a new leg of our journey. Five months absolutely flew by and although we got to see a ton of cool stuff, there’s still so much more to discover. With a limit on our time in America, we tried to make the most of every day we had and really hope that you Americans are doing the same – politics and beliefs aside, America is a beautiful place that is so diverse and accessible to people willing to uncover it. We’ll have another dip down in the Midwest on our way back to Toronto where we’ll be sure to savour every dollar spent on that sweet, sweet, cheap gas that we’ve reluctantly bid adieu to.